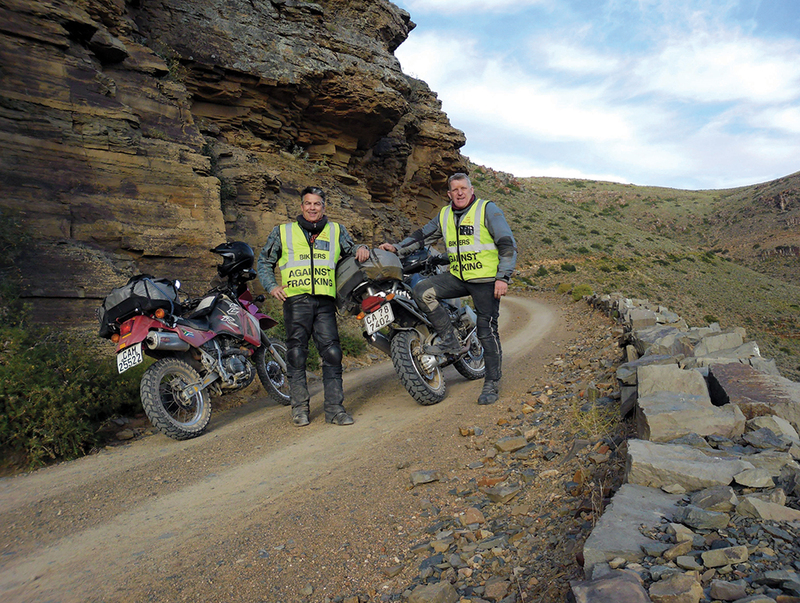 Long-time adventure biker, freelance travel journalist and author of Circling the Great Karoo, Nick Yell, tells us how his love affair with riding motorbikes through the region started, and summarises its appeal for adventure riders. 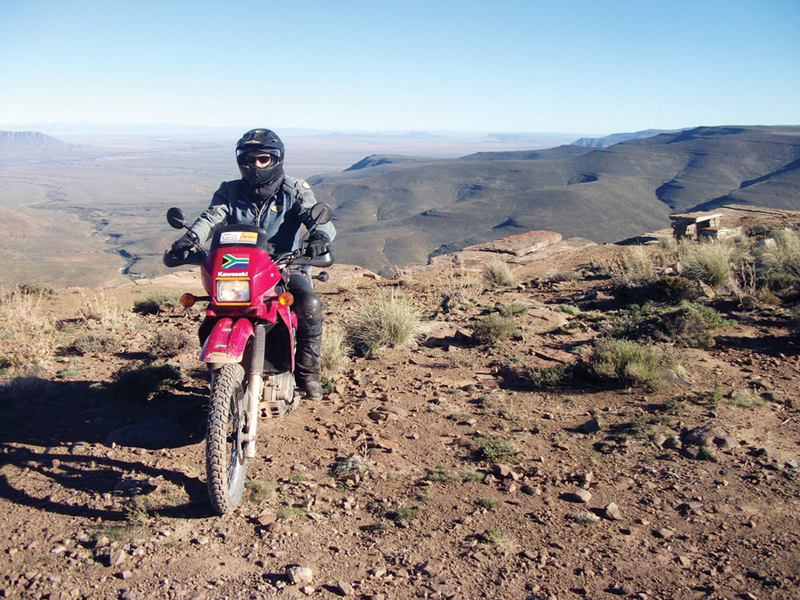 My love of riding dual-purpose motorbikes through the Karoo started with an epiphany. I was in a cottage, halfway up a hill overlooking the veld to the Valley of Desolation near Graaff-Reinet. I had always hankered after a more fulfilling and balanced lifestyle; one that wouldn’t see me spending the majority of my life at the office or in traffic; one that would allow me to work from home, even in my pyjamas, if I felt like it. It reminded me that writing had been something I had loved doing as a kid, first inspired, as it was, by the moustachioed pyromaniac. But during my later years there had been other distractions and I had forgotten about this passion; until the fiery-coloured bumblebee coaxed it out of me. The turn-off into the Karoo veld arrives sooner than expected. The tar runs out and morphs into a rough dirt track which blends into the staggered clumps of yellow grass and scrub stretching to the horizon. A heavy kori bustard labours into the air to my left and I begin to realise that this expansive playground is now my new backyard; millions of hectares of Karoo veld teeming with hidden succulents, flowers, buck, predators, rodents, birds and snakes — as well as many stories from its ancient past. It’s not just some transitory holiday respite; the vast plains of the Camdeboo are now accessible to me at all times, for as long as I need. Without warning, the dirt track caves in on itself. The bike and I clatter back to earth with a jolt, sidestepping the river course that has eaten through the road during a recent storm. A family of Kudu materialises from beneath the skirts of some flowering Mimosa trees; the bike’s unfamiliar sound seemingly urging them to escape from their hiding place. Effortlessly, the leading female crests the five-foot fence, her large round ears framed against an advancing whirlwind of spiralling dust. The calf follows tentatively; the magnificent bull just behind. His horns spike the air with grace as he clears the fence with room to spare. When I turn back towards the village later, I appreciate the comparatively smooth surface of the wider gravel road that promises to lead me there in relative comfort. But, a little way on, an abandoned railway station piques my curiosity and I decide to check it out. Looking through the windows, I’m amazed to see files strewn on the floor; as if the staff had to make a quick getaway when the enemy of redundancy — like a wave of Wyndham’s triffids — suddenly advanced upon them. Timetables and clipboards with delivery notes flutter restlessly in the hot semi-desert breeze; trying to reiterate their past importance. Leaving the nostalgia behind on the weed-strewn platform, I head for home through the desolate wonderland of my new backyard; replete in the knowledge that the Great Karoo surely holds more than a book-full of experiences just like this — and that someone ought to write them down; before the remaining wild animals and old buildings turn to dust. 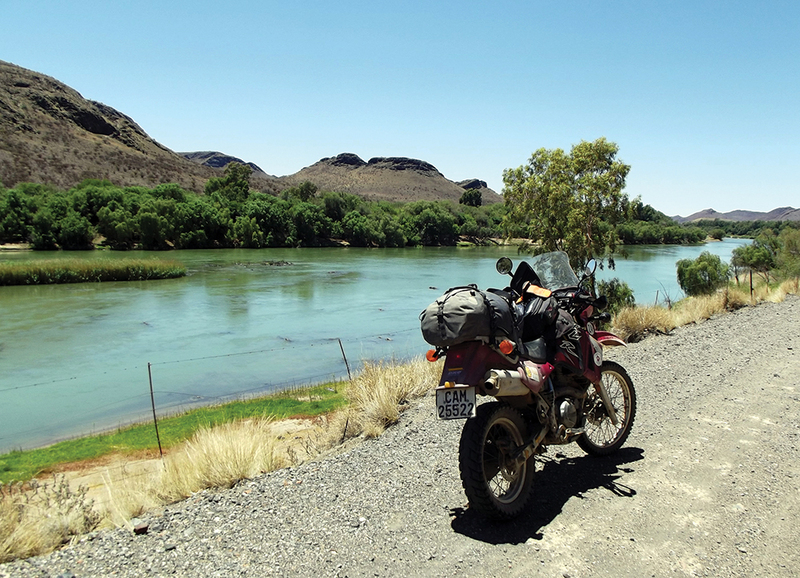 Within days of this experience, I had packed a bag and set off to circumnavigate the Great Karoo – some 3 000km of predominantly dirt-track riding through some of the loneliest and most desolate country on the planet. 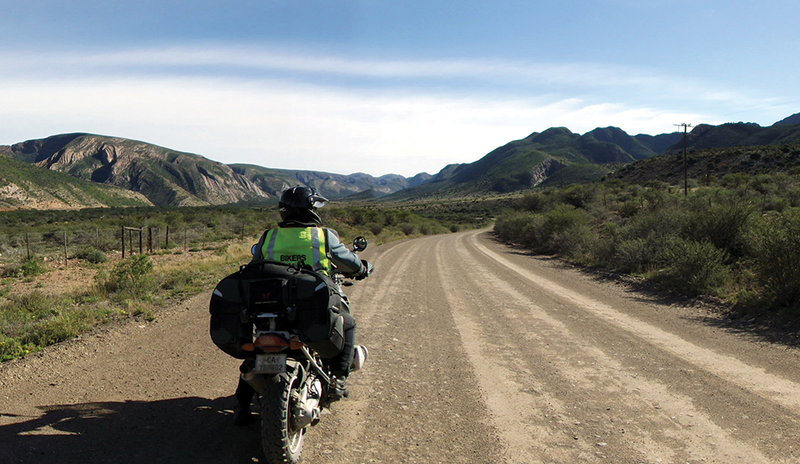 It was a journey that culminated in my book, Circling the Great Karoo, and which started my hunger to continue riding the meditative Karoo dirt tracks until I’m too old and feeble to do so. 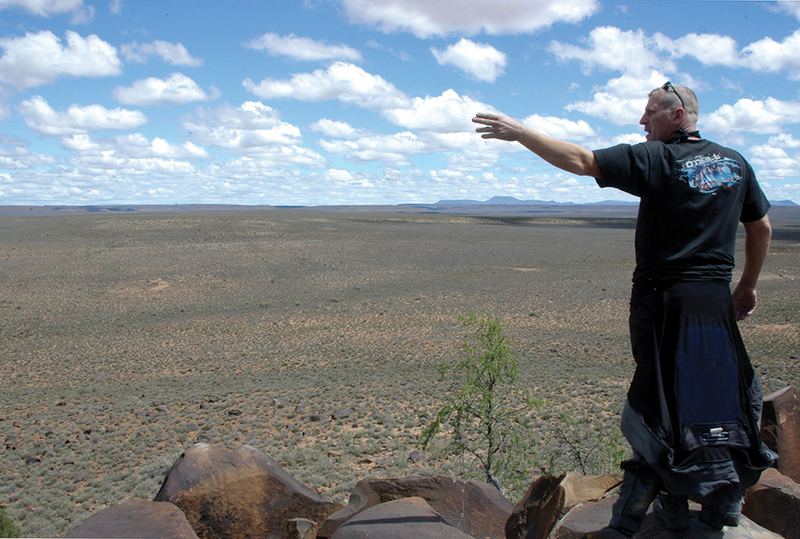 The boundaries of the Great Karoo are difficult to define. 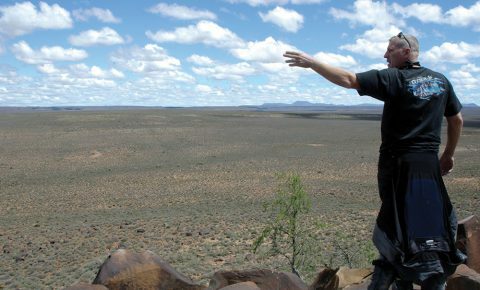 That’s because the term ‘Karoo’ describes a unique composite of different elements such as the type of soil, vegetation, topography, rocks and, most importantly, climate. If all these individual Karoo-like regions are added together, the total area takes up around one third of South Africa’s surface — well over 400 000km2; an area significantly bigger than Germany. The characteristics of the Great Karoo vary greatly, but in the main it is an arid region (rainfall varies from 50mm in the west to 375mm in the east) with sparse plant cover; predominantly made up of succulents. Temperatures range from below 0°C on winter mornings to close to 50°C in high summer, while the topography is mainly made up of a raised plateau (elevation around 1000m) fringed by ranges of dolerite-silled mountains and isolated collections of koppies. The only way to farm in a water-scarce region like this is to pump the groundwater. Thankfully, the Karoo is blessed with a rich network of unique artesian wells that has allowed it to support huge flocks of sheep, goats, cattle and game over the centuries. It was the introduction of the humble wind-pump in the mid-1800s that made it so. If fracking for shale gas is allowed to go ahead, however, this water could become contaminated. 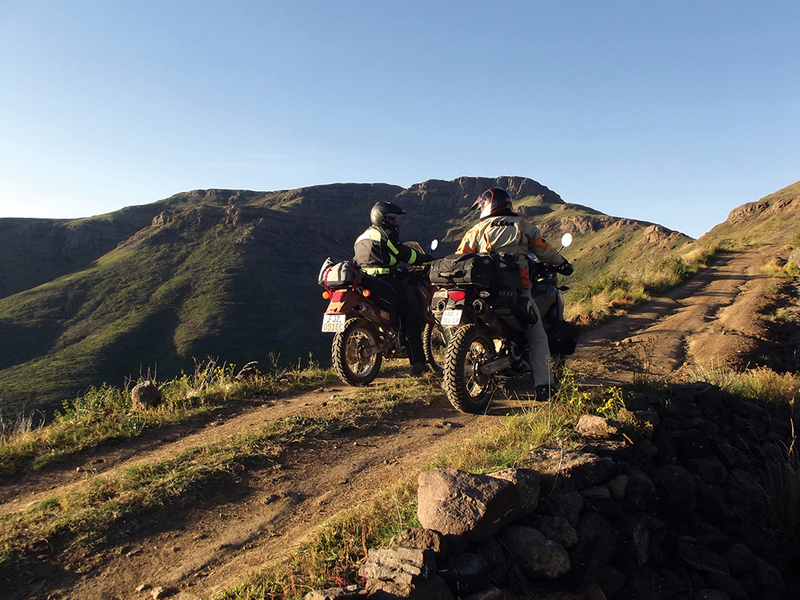 These are rough guidelines and we suggest riders consult recent maps carefully (Tracks4Africa) or engage a guide. 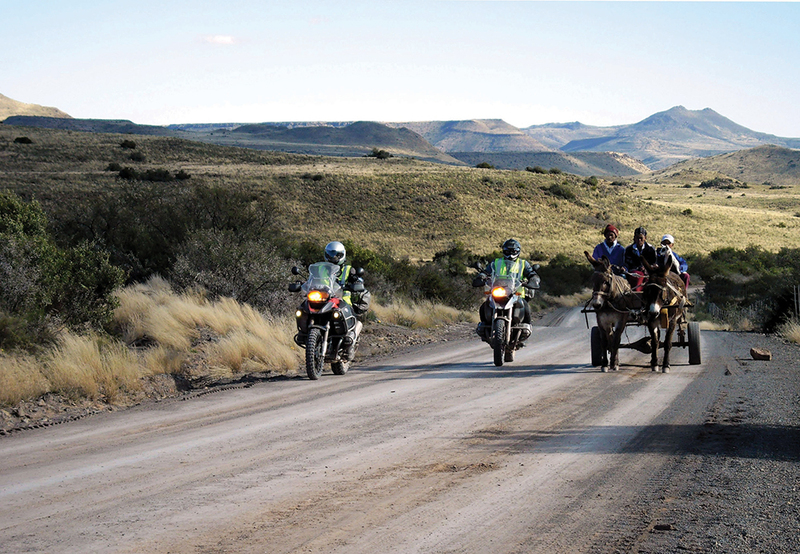 Average difficulty ratings assume dry roads as Karoo roads can become tricky when wet,; especially the red clay variety. Google the names in brackets for our accommodation suggestions. Around 880km (400km on dirt) over four days, three nights. Difficulty rating: Beginner to Moderate. 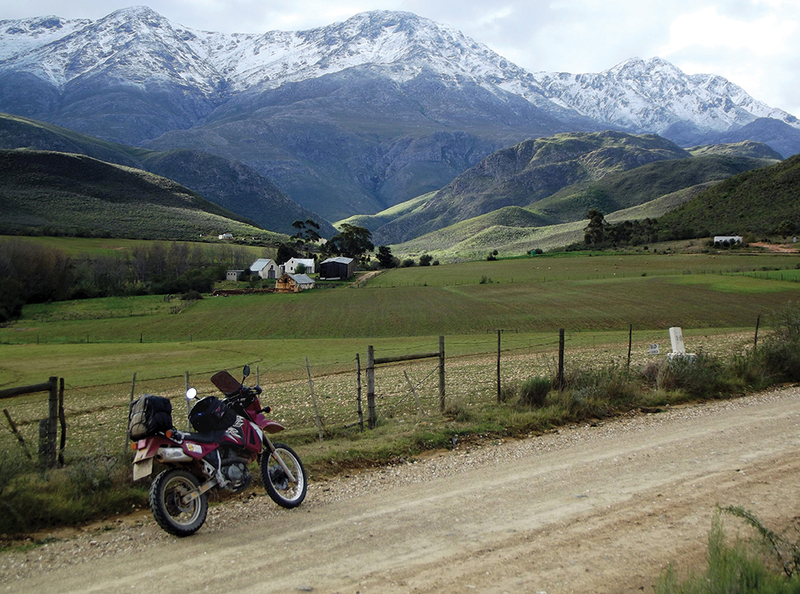 Highlights: Bot River to Greyton; Tradouw’s Pass; Seweweekspoort; the Witteberge dirt track and Ouberg Pass. Day 1 (155km; 65km on dirt): Cape Town to Greyton (The Post House) via Bot River, Van der Stel Pass and Helderstroom Prison Road. 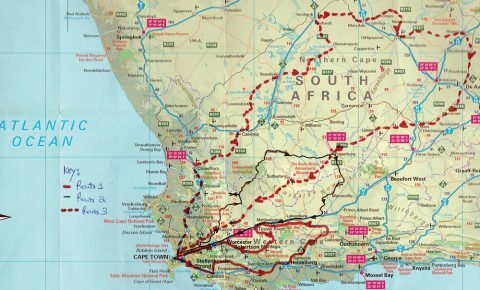 Day 2 (245km; 84km on dirt): To Ladismith (Ladismith Country House) via Riviersonderend, Protem, Swellendam, Tradouw’s Pass and Barrydale. Day 3 (303km; 249km on dirt): To Montagu (Cynthia’s Country Cottages) via Seweweekspoort, Witteberge road, Touws River, Bloutoring and Ouberg Pass. Day 4 (175km, all tar): Back to CT via R62 to Worcester and from there, past Paarl on the N1. Around 1 125km (580km on dirt) over five days and four nights. Highlights: Bainskloof Pass; Katbakkies Pass; Gannaga Pass; Fraserburg to Merweville and the Witteberge dirt loop. Day 5 (182km; all tar): Back to CT on N1 from Touws River. Around 1 900km (1 276km on dirt) over seven days and six nights. Difficulty rating: Moderate to Experienced (primarily because of distances and fatigue). Highlights: Clanwilliam to Calvinia; Moordenaarspoort; Marydale to Middel Koegas along Gariep River; De Aar to Victoria West; the Old Post Route via Hondefontein; the Ceres R356 and Bainskloof Pass. 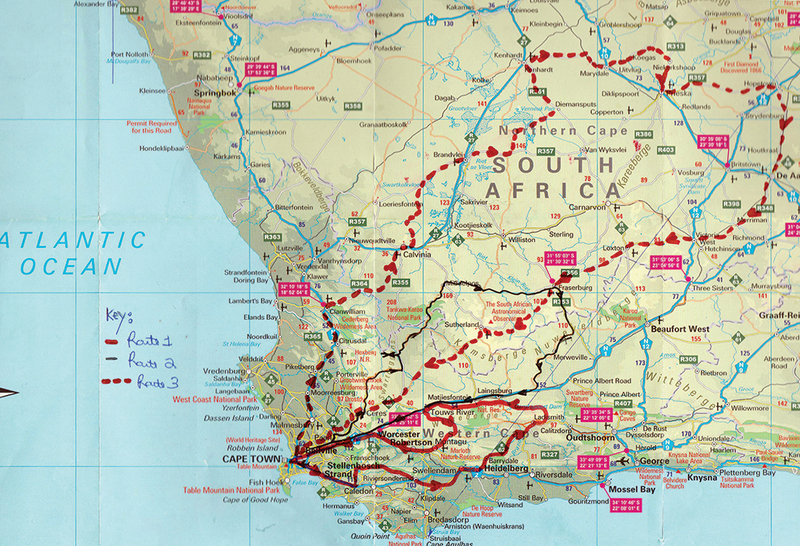 Day 6 (212km; 174km on dirt): To Sutherland (The Galaxy) via Loxton, Fraserburg and Hondefontein (the Old Post Route). Day 7 (320km; 113km on dirt): Back to CT via Verlatenkloof Pass and then R356 (Ceres) dirt track, then through Ceres and Bainskloof to Wellington, Paarl and finally on N1 to CT.
I’ve covered well over 100 000km of the Karoo’s dirt tracks on my Yamaha XT250, Kawasaki KLR 650 and Suzuki DR650, 1991 Honda Africa Twin (XRV750) and numerous other motorbikes I’ve had on test. The best-sized dual purpose bike to handle the great variety of Karoo terrain, in my opinion, is between a 650cc and 800cc. It’s encouraging for me that there are still hundreds of thousands of kilometres of dirt tracks out there for me to explore. 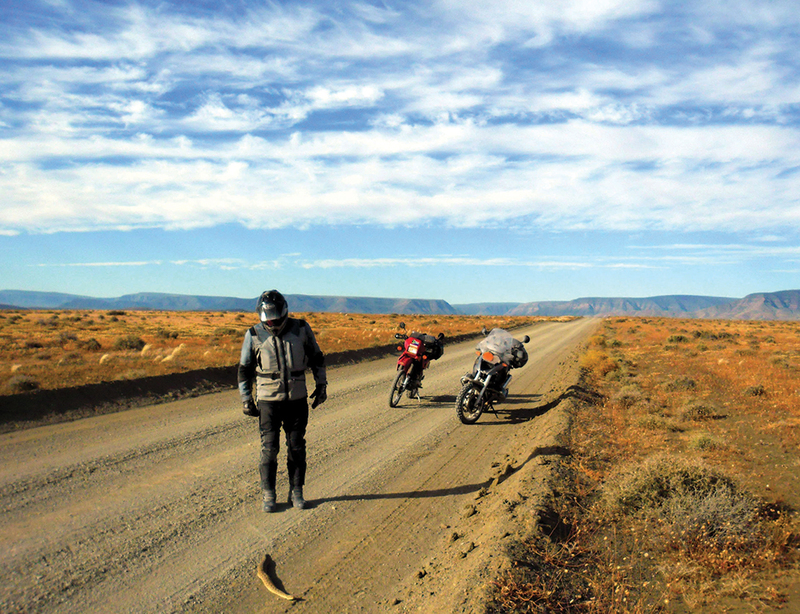 It’s these dirt tracks — most in good condition — that criss-cross the Karoo, as well as its ultra-low population density which allow the adventure rider to really get away from it all and be at peace in the liberating expanses of wide-open veld. While you need to ensure that you are self-sufficient in terms of mechanical breakdowns and emergency medical needs — cellphone reception is mostly non-existent — it is generally one of the safest regions to travel through in South Africa. In fact, should you have a problem; the local farmers will certainly help you out where they can. With a relatively new girlfriend as my pillion, I once got a flat tyre I couldn’t fix and was stranded 70km from the nearest town. A passing farmer took the bike and us into town and waited until we got sorted — such is the hospitality of the people. Want to do this? Here’s what to expect, how to prepare, costs and more. • Prepare to be wowed by the wide open spaces and unique, semi-desert scenery and Zen-dirt track riding. Don’t be surprised if you don’t see another car or bike all day. • Bike preparation (including a selection of spares and tools); the right tyre selection and correct pressures (always dual-purpose knobblies plus compressor) are essential; a good first aid kit and sufficient water (one litre per rider, minimum) are a must. • Other essential equipment: GPS; rainsuit; towrope; tyre plugs and sealant, spare tubes and oil, Pratley’s Putty, cellphone and/or satellite phone (can be hired). • Riding conditions: highly variable, dependant on rain. Thunderstorms are common in summer and what was a reasonable dirt track half-an-hour ago can become like ice after a quick downpour. Also beware of the thin ridges of sand and gritty gravel on either side of the track as these can be front wheel-grabbers of note. • Number of riders suggested: minimum of three and maximum of six (easier for accommodation purposes). • Dual-purpose bike hire in Cape Town: There are a number of good bike and protective gear hire outlets, two of which are: Dual Sport Africa and GS Africa. • Accommodation and food: There are good B&BS, guest houses and farm-stays scattered all over the Karoo, although most of them are concentrated in the towns. Majority are self-catering and the average price per person per night is about R300. • Fuel availability: Even the smallest towns normally have fuel; but because towns can be very far apart (as far as the 255 km between Ceres and Calvinia) it’s advisable to take a spare fuel bladder (like the Desert Fox – see www.bikegear.co.za) with you. 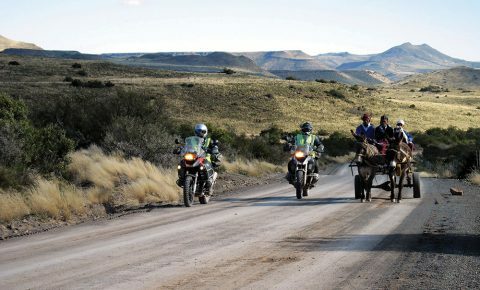 • Best routes into the Great Karoo from Cape Town: N1 past Worcester and De Doorns towards Touws River and then left 9 km out of town to join the Ceres to Calvinia gravel road some 33 km distant. An Alternative is to head out on the N2 past Somerset West, turn left at the hamlet of Stormsvlei after Riviersonderend and then make your way to Montagu and over the gravel Ouberg Pass towards Laignsburg. • Essential links and telephone numbers: tracks4Africa.co.za, wilddog.co.za, flyingbrick.co.za and emergency services: Ambulance – 10177, Police – 10111.